The Abell Open Space is a small city-owned and community managed green space for the Abell neighborhood. 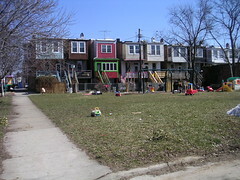 The swingset was expanded and rebuilt by Baltimore City Rec. 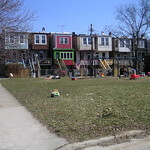 & Parks in 2008 and the location attracts children from throughout northern Charles Village and the surrounding neighborhoods. The Open Space also has a large grassy area used for recreation and a small garden in the southwest corner. During the summer months the Abell Improvement Association shows movies on Friday evenings and the site is a gathering point for neighborhood events like the Abell Street Fair. The site is especially active on weekdays from 3-6 p.m. and on Saturday mornings, when its location a block from the Waverly Farmer's Market attracts many users from outside the neighborhood. Charles Village doesn't have many parks of its own and while small, this space is actively used by the neighborhood.